Willam Penn had surveyor Thomas Holme draw up a plan for the city in 1683 which included five public spaces in an attempt to sell Europeans on the idea of moving to an established American city. Wiliam Penn envisioned Philadelphia as a "greene country towne" adorned with landscaped gardens and private orchards. Penn's initial plans called for house lots spacious enough to accommodate both a garden and an orchard. By 1683, when surveyor Thomas Holme outlined the city, they included five public squares to serve as the centers of their respective neighborhoods. In reality, Philadelphia developed much differently. The rowhomes that cramp the city's streets today include little of the greenery desired by Penn, who feared that tight living spaces worsened the spread of fires and disease. 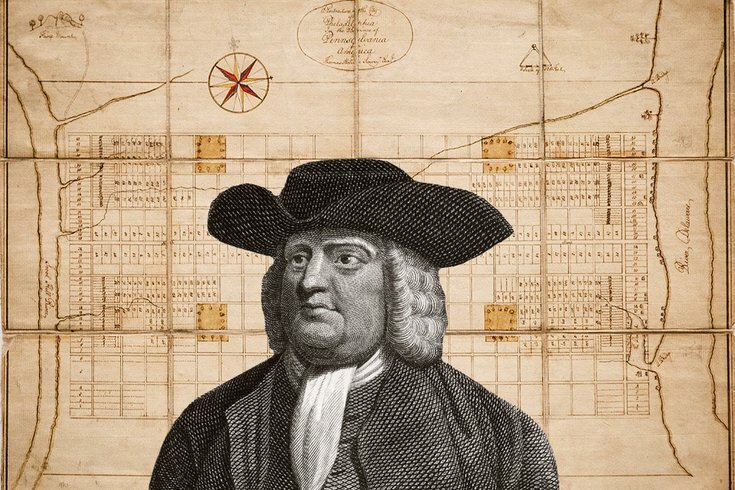 In the coming months, PhillyVoice will dig into the histories of William Penn's five public squares to learn what makes each Philadelphia park unique. But Penn's five public squares — Logan, Rittenhouse, Franklin, Washington and Centre — remain recognizable landmarks within the city, having served an array of purposes as they evolved from unkempt fields. Though the public spaces were designated on the so-called "Portraiture" designed by Holme, they took more than a century to develop into actual parks. Instead, they remained open-air fields that served — at varying times — as pastures, burial grounds and military drilling fields. One square even held executions into the early 19th century. "The reasons why they weren't developed right away was because there was no specific allotment in the charter or any of the other legal documents to say who would pay for the improvements," said Vincent Fraley, communications director for the Historical Society of Pennsylvania. "At the time, a lot of them were just for running your animals. They were pastures and things like that." That's not exactly how Penn sold the spaces to prospective settlers. His main inspiration for the public squares likely came from London's Moorfields, according to scholars. The popularity of the Moorfields, which included trees, benches and walkways, had prompted greater demands for recreational spaces throughout the 17th century. As Penn began recruiting settlers to his undeveloped city in the 1680s, the public squares served as selling points. "For Londoners it also carried the explicit political message that the squares would be preserved and protected by the civil government as public parks for healthful recreation, quite unlike the monumental plazas envisioned by (London architects), or the commons of colonial New England towns." But Penn also "condemned the idleness and self-indulgence" of London's public spaces, Milroy wrote. As a Quaker, he viewed cities with moral skepticism, envisioning Philadelphia as an environment where taverns, theaters, gambling and horse races would be forbidden. Penn found no danger in landscaping and trees alone. He was a dedicated gardener, but his plans for private gardens and orchards also reflected his practicality. Having survived the Great Fire of London in 1666, and its outbreak of plague a year earlier, he viewed the spacious lots as a safety enhancement. "He wanted this sort of 'greene country towne,' as he called it," said Fraley who has researched Penn's squares. "Again, that's influenced not only from his own personal predilections for the country life, but because of the plague and the fire that he himself lived through." Penn's Quaker values also impacted their initial names. Because he objected to naming locations after people, he instead chose to simply designate the squares by using their cardinal directions. This belief ran so deep that Penn apparently once tried bribing an English minister to change the name of his own colony from Pennsylvania. "We found this letter where he tried to bribe an undersecretary — a minister — to go and change it," Fraley said. "He's sort of complaining to his friend that 20 guineas wasn't enough to have this minister literally go into the charter and scratch out the name. It's this odd moral structure where, lest you be thought of vain, you're willing to devolve into bribery." Thus, the four corner squares retained their original names — Northeast, Northwest, Southeast and Southwest — until 1825, when French General Marquis de Lafayette completed a much-heralded return to the United States. With memories of the American Revolution fading, Lafayette's visit prompted a push to preserve and document American history. "At the time, there were only a few founding fathers left alive," Fraley said. "Because there wasn't much ... historical consciousness, a lot of folks were afraid that once the last living links passed away, we would be unmoored. We wouldn't know our history, because we weren't collecting it." Historical societies and studies sprouted up across the country. In Philadelphia, residents first began referring to the Pennsylvania State House by its current name, Independence Hall. And the city renamed four of its five squares after former Mayor James Logan, ambassador Benjamin Franklin, former General George Washington and David Rittenhouse, the first director of the U.S. Mint. The new names marked a significant milestone in the squares' histories. Partly because Penn had provided no direct funding mechanisms for his public squares — or instructions for their improvements — their transformation into the modern parks appreciated by Philadelphians today was only beginning.